Ted Carmichael Global Macro: Tiff, We Hardly Knew Ye! Tiff, We Hardly Knew Ye! Tiff Macklem will soon be leaving his post of Senior Deputy Governor of the Bank of Canada to take on the role of Dean of the Rotman School of Management at the University of Toronto. On February 7, Macklem gave his final Bank of Canada speech, titled "Flexible Inflation Targeting and Good and Bad Disinflation". It is perhaps the most insightful statement yet on how the Bank of Canada's views on the inflation process have evolved in the years since the Great Financial Crisis. With the BoC preparing for the rate decision on March 5, Macklem's clearly expressed views on why inflation has fallen below the BoC's 2% target and remained there for 20 months should be required reading for all Bank of Canada watchers. disinflation caused by a shortfall of aggregate demand is considered "Bad Disinflation" by the BoC and does require a monetary policy response. 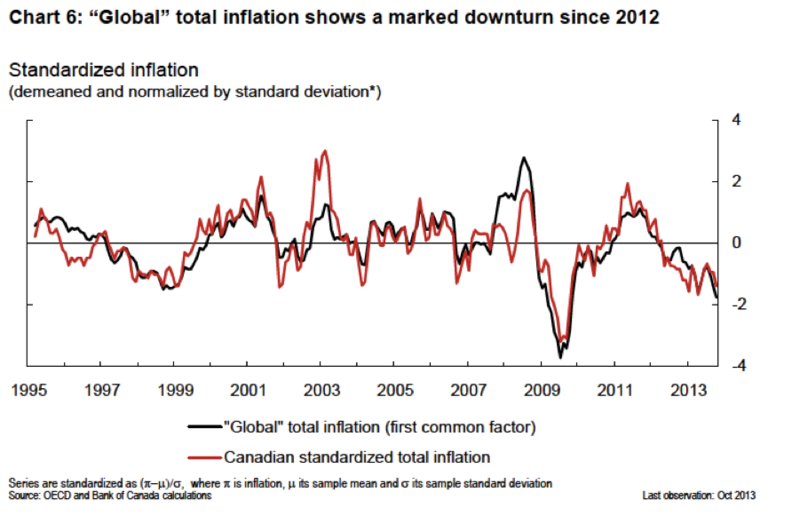 Macklem explains, "Looking at the relevance for Canada of global inflation developments, it is evident that Canada’s total inflation rate co-moves substantially with the common factor in inflation among advanced economies, underscoring the importance of energy and food prices for movements in total CPI inflation in Canada." Most of the variation in Canada's total CPI inflation is explained by movements in global inflation, which in turn are driven by movements in global food and energy prices. Macklem goes on to point out that the conventional assumption that core inflation is significantly influenced by the output gap is not borne out the evidence. Econometric estimates of the influence on core CPI inflation of the output gap suggest a coefficient value of around 0.1 which does not meet standard tests for statistical significance. Given the BoC's assessment that the current negative output gap is about 1¼%, Macklem notes that the output gap would predict core inflation of 1.9%, well above recent levels of just over 1%. This implies that a large positive output gap of 5 to 10% of potential GDP would be required to return core inflation to the 2% target. As Macklem points out, "This is not realistic". Inflation expectations are fairly stable, but are under downward pressure as long as inflation continues to fall short of the 2% target. Consensus forecasts by economists expect inflation of 1.5% in 2014 and the majority of respondents to the BoC's Business Outlook Survey expect inflation between 1% and 2%. Macklem argues that there is "little evidence that inflation expectations are becoming unhinged from the 2 per cent target", but acknowledges that if disinflation persists, there is a risk that inflation expectations will also decline. The entry to Canada of many big-box retailers including Walmart and Target appears to be putting downward pressure on consumer goods prices. Macklem indicates that BoC research suggests that this factor, not included its inflation model, may account for as much as 0.3% of the weakness in core inflation. Macklem concluded his speech by acknowledging that the BoC cannot fully explain the weakness of CPI inflation, but that increased retail competition appears to be an important factor. He then argues that disinflation caused by retail competition is "Good Disinflation" and contrasts it with disinflation caused by weak aggregate demand which he refers to as "Bad Disinflation". With this distinction made, he argues that the BoC does not need to adjust monetary policy to resist Good Disinflation, which he believes will abate on its own over the next year or two. However, should there be a weakening in aggregate demand relative to the BoC's current expectations, then it would be appropriate for the Bank to respond by easing monetary policy. This is a new twist for the BoC but is reminiscent of a distinction made several years ago between "Type 1" and "Type 2" exchange rate depreciations as a rationale for BoC inaction. That distinction was difficult to measure empirically and was eventually dropped. Tiff Macklem's final speech of his BoC career, in my view, is a model for how the Bank of Canada should communicate with markets and the general public. We can only regret that we won't have his clear communication in the future. As to the implications for near term monetary policy, it seems clear that, for now, the BoC is willing to consider the 20-month period of below-target inflation as a case of "Good Disinflation", which does not require a monetary policy response in the form of an interest rate cut. I doubt that the Good vs. Bad Disinflation distinction will have any longer shelf life than Type 1 vs. Type 2 currency depreciation distinction did. It is also clear, however, that the BoC lacks a full explanation of persistently below-target inflation. The BoC is wary that any further disinflationary shock could push inflation further below target and thereby risk "unhinging" inflation expectations to the downside. Should that occur, returning inflation to target could take considerably longer than six to eight quarter horizon over which the BoC aims to return inflation to the 2% target. Consequently, the BoC is unlikely to change its forward guidance, which Macklem expresses like this: "The timing and direction of the next change to the policy rate will depend on how new information influences [the] balance of risks." Good luck with your future endeavours, Tiff. You will be missed.